BRIGHTON, Mich - Did you hear?! 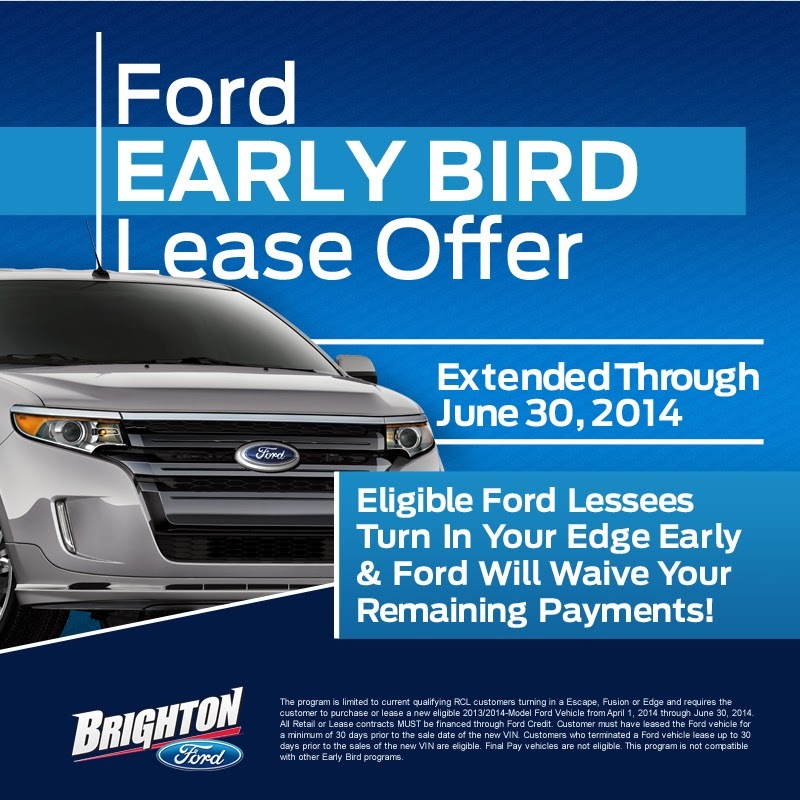 There is an Extended Early Bird Lease Offer at Brighton Ford until June 30, 2014! Get out of your current lease and get into a brand new 2013 or 2014 Ford Edge, Fusion, or Escape! You don't have to feel stuck in your lease any longer; Brighton Ford can help you! With Brighton Ford, you can turn in your vehicle early and get an amazing upgrade! You can even have up to 5 months of remaining payments waived. Don't waste any more time! Take advantage of this amazing deal and drive away in a brand-new Ford Edge, Fusion, or Escape. For more details about the Extended Early Bird Lease Offer at Brighton Ford, stop by the dealership today! If you are in Dearborn, or one of the surrounding areas, and are looking for a new or Used Car Dealership with the best selection of Fords, we are the place for you! At Brighton Ford, we treat our customers like family and are sure to find you the Ford that you have been searching for! All-New Ford Mustang Has a "Need for Speed"